As someone who's suffered the consequences of over-consuming lower quality albacore for 30+ years, I can tell you that all tuna is NOT created equal. Like many things in life, I didn't bother questioning the quality of what I was ingesting until I developed an illness known as Chronic Fatigue Syndrome (aka "Epstein Barr" or "CFS"). 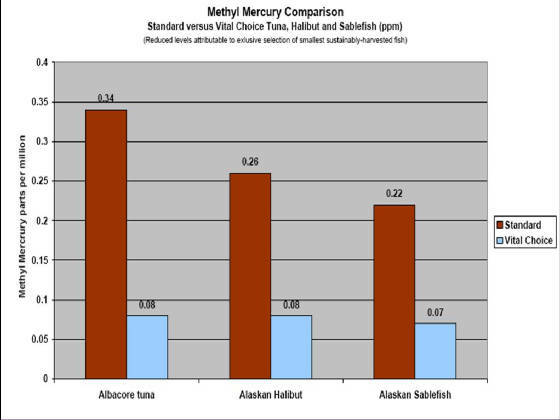 After a series of tests and a ton of research on the subject, by process of elimination, I discovered it was the mercury from tuna that was a driving factor behind my condition. I was forced to stop eating it altogether for a few months....OH THE HORROR! Although I now consume Vital Choice® to collectively address my tuna salad cravings and health needs, I had to go through a detoxification process before I began eating tuna again. One product that helped me tremendously was Bio-Chelat, a specially designed "chelator" that assists the body with expelling heavy metals. To find out more about this incredible product CLICK HERE. I'd be happy to share what else I've learned with anyone who may be suffering from a similar condition. Feel free to fill out the comment form below to share your story.